You don't need this post to find out how to make a Deep-Sea Diver. Our reference was American Bar by Charles Schumann, published by Abbeville Press, Inc., New York, Paris, and London. This recipe is quite standard and all over the Internet. 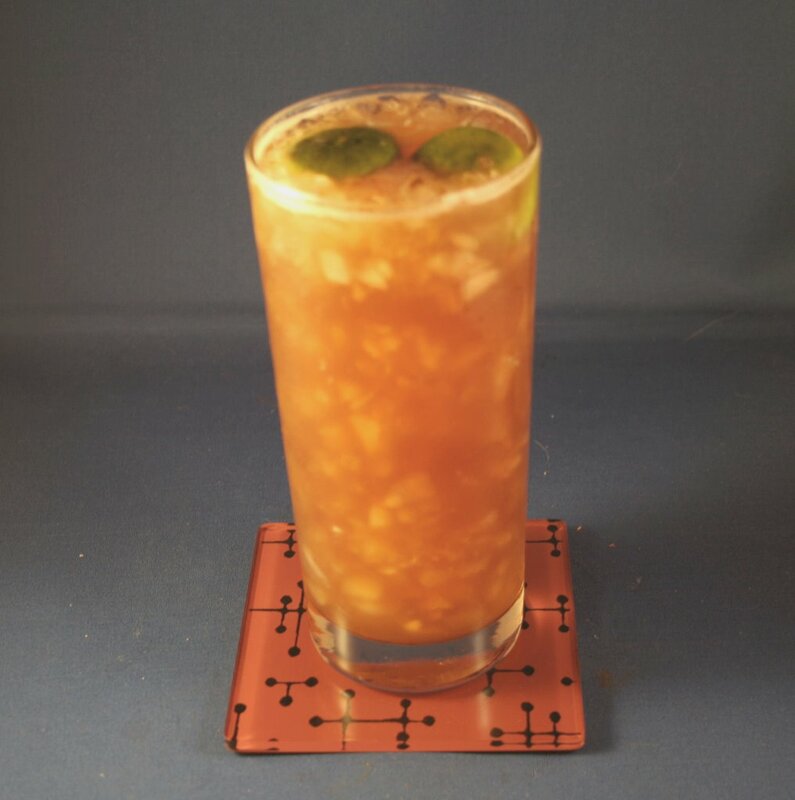 Simply Google "deep-sea diver cocktail," and it should show up in at least three places. We like our picture, however, and by substituting the juice of four key limes for the juice of one Persian lime and then plopping two crushed key-lime halves into the glass, we offer you a bit of variation. The Deep-Sea Diver is about as potent a legitimate cocktail as you're likely to find. Not many drinks call for two ounces of high-proof rum on top of so much else. My favorite high proof rum has always been Lemon Hart 151 Proof Demerara from Guyana. Unfortunately, in recent months, none of the local liquor stores that used to carry it are able to get it any more. I miss Lemon Hart and am curious to find out what happened. Hopefully, we'll be able to post the answer in a couple of weeks. For the Deep-Sea Diver above, Pusser's 95.5 proof British Navy Rum from the British Virgin Islands was substituted. Remember, this post relates to how we soothed the frustration of returning from a trip with a backlog of posts, a packed agenda for new posts, and Internet access problems with no resolution in sight.In retrospect, it is fortunate that our Good Friday Shad Roe dish turned out so well. Read about it in our next post. Shake well over crushed ice in a shaker and strain into a large highball glass filled with crused ice. Drop squeezed (key)lime(s) into glass.